Day 4. 17th of August, 2007. 2 hours away from the screening of 'The Elephant and The Sea'. I sat in the Guest Office, surfing the Net. Finally got the chance to update my blog with two consecutive posts about my first two days in Chile. It was 2pm (2am in Malaysia), some people on my MSN list were online. I wasn't nervous, just excited. So excited that I needed to vent, needed to come in terms with the act that I was representing Malaysian cinema like an ambassador of sorts, to be present when many of the Latin American audiences will be watching a Malaysian film for the very first time in their lives. Me, of all people, speaking to audiences half a world away about Malaysian cinema and filmmaking? How can I not feel a sense of excitement or pride? I've given many public speeches in my life. Story-telling competitions in primary school. (Never won) Club announcements in high school. (Was English club president) Serving as emcee in Comic Fiesta 2003. Oral presentations in university. 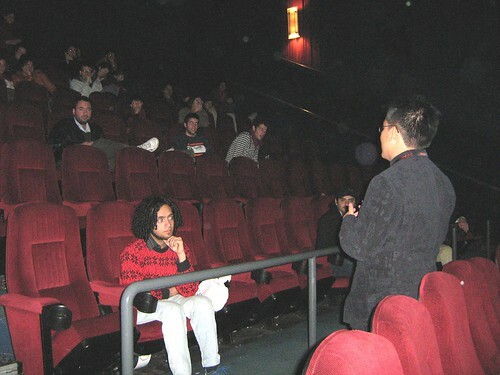 And most recently, in local screening events of my short films like Filmmakers Anonymous 2, I'm never shy in front of the crowd, yet this very 'idea' of being a 'representative' of Malaysian cinema left me breathless. As if I was carrying the burden of the entire nation, that every single word I said would be taken into account. Overdramatic? Anyone in my shoes might have a similar sort of feeling. A Malaysian blogger was online. I've never met him in person, I haven't spoken to him online that much either, so I messaged him. Him: Hey you, haven't seen you in a long time. Me: Yeah! Long time no chat! Where have you been, man? Him: What do you mean? Just go read my blog and you know what have I been doing. Go to this URL. He then reminded me his URL. I didn't click, I'm a conversationalist, I'll be damned if I let a conversation die like this. 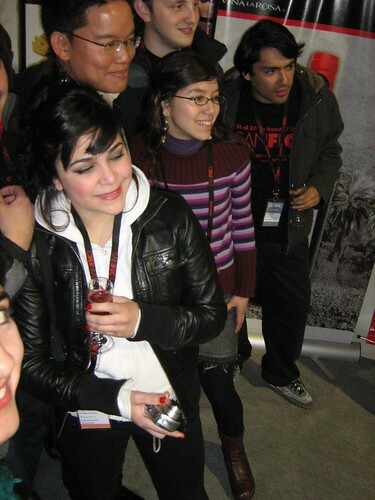 Me: Man, I'm so excited, I'm in Chile, for this Santiago International Film Festival! Him: Oh yeah, I remember you've always been obsessed with films and filmmaking. Me: ... Huh? I'm a filmmaker and producer, film IS my career. It's not as if I were some random bum who daydreams about filmmaking while sitting in front of a TV at his living room. Obsession? Come on, films had always been such a big part of my life when I grew up that it's as natural to me as drinking water, you can't say someone's obsessed with water or food. Him: I didn't say anything, I'm just saying it as it is, you're a guy obsessed with films and filmmaking. That's all. Me: Anyway, I'm representing this local film that's competing at this film festival, and I'm going to present it and then chat with the Latin American audiences during its Q and A session after the film! I wonder what are they going to ask me! Him: I'm not interested. I don't really care about films and filmmaking. Nor do I have the knowledge. Me:... that's very supportive of you. Guess I can't really accuse this guy of being insincere about his feelings towards my well-being and filmmaking endeavours. Me: So, what have you been up to? Him: Nothing much, I'm interested in photography, but unlike you and your filmmaking, I'm not obsessed with it. Right now, I'm just waiting for my friends to get up so we can play DOTA. Me: Hey, you made it seem as if my love for filmmaking is an unhealthy thing. It's not obsession, it's passion. Him: All kinds of obsession are unhealthy. Him: So is having too much of a good thing. Him: I'm going off now, I want to play DOTA. I reached the multiplex early, going to the projection room, making sure the tape of my film was working so that my screening wouldn't get canceled again like it did in Day 2. "Hola!" The crowd greeted me in return. "Mi nombres Edmund Yeo de Malasia!" I said. When saying that, I pronounced my name as EDUMOONDO because that was the Spanish pronunciation of my name. And MALASIA wasn't a typo, Malasia's Spanish for Malaysia. I continued. "Thank you very much for attending the Latin American premiere of the Malaysian film, 'The Elephant and the Sea'. Muchas gracias. There will be a q and a session after the film, so please, please, don't go away." They replied with a very warm applause. "Is it difficult to make independent films in Malaysia?" "How was this film received in Malaysia? Are the government and the locals supportive of independent films?" "Can you please tell us the thematic elements the director wanted to convey?" "This film is very visually stunning, as if the scenery of the portrayed village had come to life by itself, is it part of the script to make the scenery so beautiful?" "What inspired the director to make this film? Was it autobiographical?" "Can you tell us about the pre-production stages of this film?" "Are there any international film festivals in Malaysia where non-mainstream films are introduced to audiences?" I took my time to answer the questions, and shook hands. Many of them really liked the film, was glad that they did. 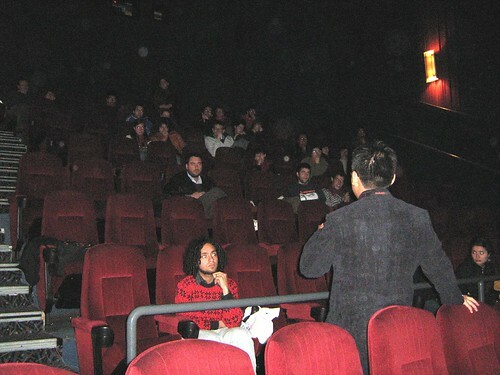 The session went on for too long, and Hu Shu's film, I WANT TO DANCE, was going to start screening (the first screening of the film, which I attended, was chronicled in detail on Swifty In Chile (Part 3)), so we were all asked to leave the theater. I was then led to a van that would bring me back to the hotel. I realized that I really enjoyed the moment. 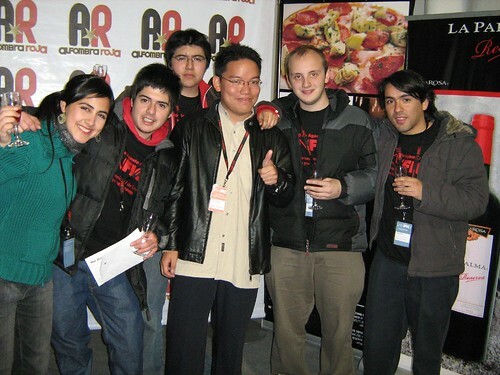 ... definitely more than what I would have felt for DOTA. Some photos I took later that night, during the 'HAPPY HOUR' event. Go to Swifty In Chile (Part 5): Visiting Pablo Neruda's House - La Chascona And Learning Spanish.